She is really patient, caring and knowledgeable. She took the time to answer every question I had.Truly a great doctor! Dr. Giordano is wonderful. She listened and asked all the right questions and came up with a diagnosis that makes senseto me, but I sure couldn't derive myself from all the medical websites and blogs I'd visited. Ohhh...that's why you see a DOCTOR! My relief was almost immediate and I'm back to being my happy, active, toddler-hoisting, jogging and yoga-ing self. I'm hopeful that following Dr. G's recommendations will keep me this way..
Dr. Giordano is wonderful. She listened and asked all the right questions and came up with a diagnosis that makes sense to me, but I sure couldn't derive myself from allthe medical websites and blogs I'd visited. Ohhh...that's why you see a DOCTOR! My relief was almost immediate and I'm back to being my happy, active, toddler-hoisting, jogging and yoga-ing self. I'm hopeful that following Dr. G's recommendations will keep me this way..
Dr. AnnaMaria Giordano attended the New College of Podiatric Medicine to receive her degree. She then completed her podiatry medicine/surgery residency training at North Shore University-LIJ Health system at Forest Hills, Manhasset, and Southside hospitals. Her dedication, compassion, and commitment is what attracts patients to the practice. She has been serving the community since 2007, and continuously looks forward to treating patients. Dr. Giordano treats patients that are experiencing foot and ankle conditions with thorough care. Dr Giordano took the time to explain everything she was doing before she did it. Very friendly and professional. Dr. Giordano is thorough, knowledgeable and compassionate. I cannot recommend her highly enough. She was very nice and professional with her work. Visit went smoothly and quickly! Great bedside manner! The office is a bit outdated but she seemed very professional and all equipment looked very clean. She has such a friendly and welcoming character. She listened to everything I had to say and made sure all of my questions were answered. I would highly recommend her. Dr. Giordano was understanding and empathetic towards my pain and fear of needles. My procedure was successful and longer have pain on my foot. I have referred her to my family. Dr. G is amazzzzzing!!! She was very sweet and informative. I don’t like most drs but I did like her. She didn’t rush the appointment. Dr. Giordano is friendly and has a wonderful way of making the patient feel relax. I would recommend her to anyone who is looking for a Podiatrist. My feet are so much better now. Thank you Dr. Giordano. Excellent care and advice for my Health?????????????????????????????? Dr. Giordano was great. She was very kind, considerate and has excellent knowledge of podiatry. Dr. Annamaria Giordano is an extraordinary physician! She exhibits a professional mannerism as she conveys her expertise about your medical issues. Moreover, Dr. Giordano listens attentively to all concerns and/or questions. 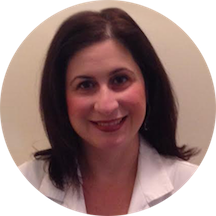 She is a wonderfullyknowledgeable Podiatrist who demonstrates a passion for curing all of your foot ills. Kudos for being a superior Podiatrist! With endless thanks, Lee Ann C.
She's great...will see her again and highly recommend her. Great bedside manner as always. She's lovely and has a great bedside manner. She explained everything she was doing and her office was very clean and professional. A very pleasant and professional experience. Excellent bedside manner. She even called me later that afternoon with my Xray results, (i was expecting to get those at my follow up,) and to see how i was feeling. She's very kind and tended to me right away. The wait was no time at all an I actually felt like she cared. .not just another patient...she will be my primary foot dr....loved her!!! Dr. Giordano has been my primary podiatrist for many years now. She's amazing! She is kind, personable, caring and super knowledgeable. I refuse to see any other podiatrist but her. Her hours are insanely accommodating to the point where youcan request an appointment on a Sunday through zocdoc for Monday morning and she will see you exactly when you want! Thanks for being so awesome Dr. G! Dr. Giordano is one of my favorite Doctors after only 1 visit. I highly recommend her practice. My appointment with Dr Giordano was a pleasure and I was extremely happy with the Physician, office staff and visit outcome. My first appointment and I was very impressed. Dr Giordano was extremely thorough and talked me through everything and answered all my questions. I did not feel rushed at all, just very well cared for. Dr.Giordano is very friendly and professional. She is informative., knowledgeable, and patient and took the time to listen and make recommendations to me regarding my condition. Highly recommended. What do I think about my visit with Annamaria Giordano? I thought it was awesome! The wait was very short (about 5-10 minutes) and the staff is very friendly. The office is nice and clean. And most importantly Annamaria is AMAZING.She was super nice, made me feel at home, and explained everything in a very calm and thorough way. She did not rush me at all and made sure I was comfortable and ready before she performed any procedures. She asked me throughout the procedure if I was ok. She basically went the extra mile to provide the best care possible. This was hands down the BEST visit to a podiatrist ever. In the end, I'm really glad I chose to see Annamaria and I HIGHLY suggest you go see her! She was extremely professional. Took the time to explain what she had to do. Made me feel very comfortable. Very nice office. Dr. Giordano was very patient and answer all the questions I had regarding my injury. She also thoroughly explained what I would expect during the recovery process. I'm happy that I went to Dr. Giordano. She is down to earth and very kind. Friendly, professional, quick and thorough! She was very competent, sweet and understanding! Dr. Giordano is awesome!!! She took me in early than my appointed time. She explains everything, and she is very thorough. She has an excellent bedside manner. Everyone in the office was friendly and professional. I had a cortisone shot and Dr. Giordano was gentle and apologetic, even though it didn't hurt. I would definitely reccomend her. Dr. G is am amazing, caring, concern, sincere, & thoughtful dr !! I'm an old patient from her old office. I followed her from the Bay Shore to Plainview !! I'm so excited & happy for her that she now hasher own practice !!! She's the BEST !!!! Thank You Dr. G ?? No wait time. Doctor was comforting to my nervous 6 year old. Very thorough and explained everything. Kind and proffessional. Office is clean and the staff is very friendly. Dr.Giordano is great. I'm really happy I found her on ZocDoc. I will definitely be referring her to other people. She is such a sweet person and very at tentative to my needs!